What Does a Mattress Warranty Cover? What is a mattress warranty and what does it cover? One common question I get is what a mattress warranty covers. Some customers remark that mattress warranties are never honored, and there is no point. Others don’t even realize that mattresses come with warranties. I hope to clear up a lot of this confusion in this post. A mattress warranty covers physical defects in a mattress. The most common problem is sagging. If a mattress sags beyond a certain threshold when nobody is on it, that is a warranty issue. This threshold is 1.5 inches for most manufacturers, though it’s 3/4th of an inch for others, like Tempurpedic. This sag is usually measured by putting a string or other straight line across the surface of the mattress, and then measuring from the string to the bottom of the sag with a ruler. Mattress warranties also usually cover coils breaking or popping out of the side, the foams up top bunching up, the seams coming out of the mattress, the boxspring breaking, or any other physical defect. If you suspect you have a warranty issue, contact the retail merchant first, and if you don’t get anywhere with them, contact the manufacturer. Mattress warranties do NOT cover against comfort issues. If your mattress feels a bit lumpy, or it doesn’t support you properly, or it causes pressure to your body, you are out of luck. This is one reason some people claim that warranties aren’t honored. Warranties only cover structural problems, not a product that doesn’t maintain its comfort over time. There are several things that can void an otherwise legitimate warranty claim. Here are some of the most common. Removing the law tag. The law tag is the tag on the back of the mattress that says “do not remove under penalty of law.” The “law” part only refers to the mattress retailer and manufacturer. The end-user is free to remove it whenever he or she wants, but this voids the warranty. It would be the equivalent of filing off the VIN from a car and expecting the warranty to be honored. There is no proof it’s the same mattress that you ordered. Stains. If a mattress is stained, the warranty is void. This even goes for problems in which the stain obviously didn’t cause the sag. Liquids can wear down the foams and cause them to deteriorate faster than they otherwise would. Additionally, stained mattresses are unsanitary, and no company wants to return those to the warehouse for a warranty claim. You can prevent stains to your mattress by using a waterproof mattress protector. These do NOT have to feel like plastic, and they are also NOT just for the incontinent. Even just perspiration, a little bit every night over the course of 10 years, can cause a stain and wear down the foams. Not to mention, there are other activities done in bed which can produce a wet spot… Protect-A-Bed makes a very popular mattress protector, but there are others as well. Improper support. You need proper support under your mattress. This can take several forms. 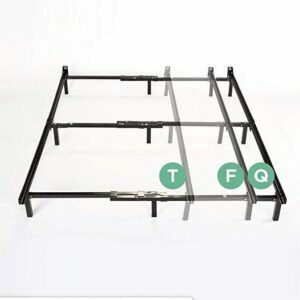 The most common is the matching boxspring on top of a metal frame with a center support bar. Using an old boxspring will almost always void the warranty. If you don’t want a new boxspring, consider getting a platform bed with either a solid surface or slats which are very close together. If you use a frame, be sure that it has a center support bar with at least one leg going from the bar to the ground. It should look something like this. The frame is used to support the boxspring. It needs a center support bar with at least one leg to the ground as shown here. I hope I have cleared up some of the confusion about mattress warranties. They only cover structural defects with the mattress (not comfort). They can be voided if you don’t take care of the mattress. Be sure to keep it properly supported by a frame or platform bed and protected with a mattress cover. Turbocharge your income with attractive articles! Thomas the promotion guy said I should send you this to help with your site on mattressnerd.com. We saw this coupon to get some free content to use on the blog, you know, to keep things fresh and updated to stay on the nice side of Google. This is normally $40 worth of goodies! I gave $1299 for a mattress that only lasted 6 mo. When I bought it they told me it should last for a long time but that didn’t happen. Now their warranty says that it doesn’t cover comfort issues. What did I even buy a mattress for? So I would never buy a mattress from Mattress Firm and suggest check ALL the warranty coverage including what the warranty dose not cover. Very dissatisfied!!!!!! Does keeping a mattress directly on the floor void warranties usually?? Are floor model mattresses which are sold as is, Does the manufacturer warranty still stay in effect? Or is it void because it is a floor model. a label was missing off one of the twin mattresses for our adjustable bed we purchased three days ago. My husband didn’t like the split so we decided to get a full mattress, so since the label was missing they would take the twin mattresses or leave the full mattress. What they didn’t say was the label that was missing wasn’t a law label but a brand label. Doesn’t that make a big difference??? We did not and would not remove a label!!!! I purchase a Simmons beautyrest Bradford legend from showroom floor. It was $1600 – 1/2 off listed mattress firm price. Not even 6 months later and there is a dip in and wedged like bumps areas just under top material. I have waited due to a move but now I hope you can guide me in a direction to get another mattress. My previous mattress was 17! Yrs old so you see why I dreamed of a beautiful mattress that would give me a cozy nights sleep. I just don’t know what to do. The slip says no returns or refunds or warranty however this is not an expected defect.this is a known defect and I should have been warned. I went in looking to buy the Gabrielle beautyrest mattress and I was politely suggested to consider this as a better option. Which needing the mattress ASAP made it a great option. Salesman was informative and friendly just forgot to disclose the potential defect of this mattress. Can you get warranty on a mattress if there’s mouse urine on it? I put my Simmons mattress with its matching box spring directly on a carpeted floor, does the box spring qualify as a “proper foundation”? Would it void the warranty because I’m not using a bed frame underneath the box spring and mattress? The mattress is 13″ thick and the box spring adds another 9.5″. Together, they’re just the right height for a short person (5’3″) like me. Must I add a bed frame just for the sake of the manufacturer’s warranty? Please advise. That is proper support. There will be no warranty issues from that.